Over the past five years, BioEYES, a community outreach program of the Notre Dame extended Research Community (NDeRC), has introduced more than 12,750 local K-12 students to scientific research and biology concepts using zebrafish. The program, which has cooperated with 85 teachers in 41 schools, reached the end of its grant funding this year, but will resume for middle school students next semester with support from the College of Science and the departments of Physics and Biology. The program involves weeklong observations of zebrafish hatching and growing, with simple lessons for younger students and sophisticated genetics instruction in high school. “It’s a promising program, very scalable, and extremely popular,” Loughran says. French, project management, and theology classes have something surprising in common: they all have an important focus on sustainability. Thee disparate classes have something surprising in common: they all have an important focus on sustainability. 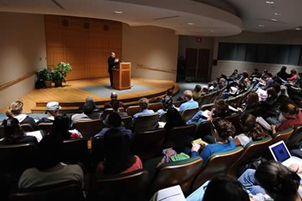 While most students expect to find such a focus in classes in departments such as Biology, Civil and Environmental Engineering, Political Science, Economics, and others, more and more classes with sustainability themes are popping up farther afield. Prashant Kamat, The Rev. John A. Zahm Professor of Science, and postdoctoral associate Pralay Santra, have published findings on that discusses their research on the efficiency of solar cells. Galaxies have a voracious appetite for fuel — in this case, fresh gas — but astronomers have had difficulty finding the pristine gas that should be falling onto galaxies. Now, scientists have provided direct empirical evidence for these gas flows using new observations from the Hubble Space Telescope. The team led by Nicolas Lehner, research associate professor at the University of Notre Dame, is presenting its work today at the meeting of the American Astronomical Society in Long Beach, Calif.
“One of the big questions remaining from our study is what types of galaxies are associated with these gas clouds,” remarks Lehner. The luminous components of most of the galaxies in the current study have not yet been identified. This team will use the Large Binocular Telescope, Keck and other ground-based telescopes to reveal the nature of the galaxies. Zoltán Toroczkai, professor of physics and concurrent associate professor of computer science and engineering, has been nominated to serve on the advisory board of Chaos: An Interdisciplinary Journal of Nonlinear Science. As a member of the advisory board, Toroczkai will submit articles to the journal, solicit articles from other researchers, and provide ideas for the direction of future issues, including ideas for potential focus areas. 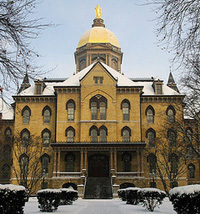 The calendar year 2012 was filled with many notable moments of accomplishment, celebration and reflection at Notre Dame. Here are some of the significant happenings.